"Paleo. Salmon. Burger. Fast snack or dinner." Mix salmon, almond meal, eggs, 1 tablespoon olive oil, salt, and pepper together in a bowl. Form mixture into patties, 1/2 cup per patty. Heat 1 tablespoon olive oil in a skillet over medium heat; cook patties until browned and heated through, about 5 minutes per side. 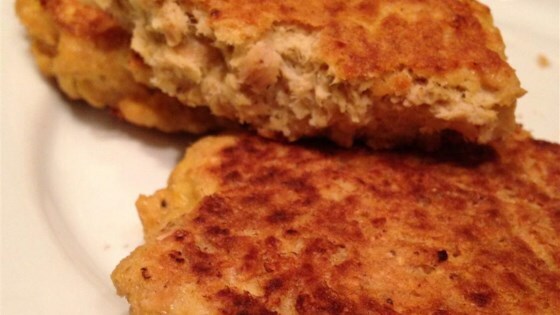 See how to make quick-and-easy salmon burgers. Another nut meal or nut butter can be used in place of almond meal. Coconut oil can be used in place of olive oil. Easy, fast, and protein packed. I like to throw in some extra spice (like lemon pepper) when I do mine though. I made no changes, they turned out good. Four stars because they were just slightly dry, but tasty and filling. Good job on the recipe, it was simple. Used 14.75oz can, 2 eggs, garlic powder, Dijon mustard, S&P, and almond meal. Made 4.5 good size patties. Put it on salad and my son ate it with ketchup. Both good! !